Now this one was fun to paint! 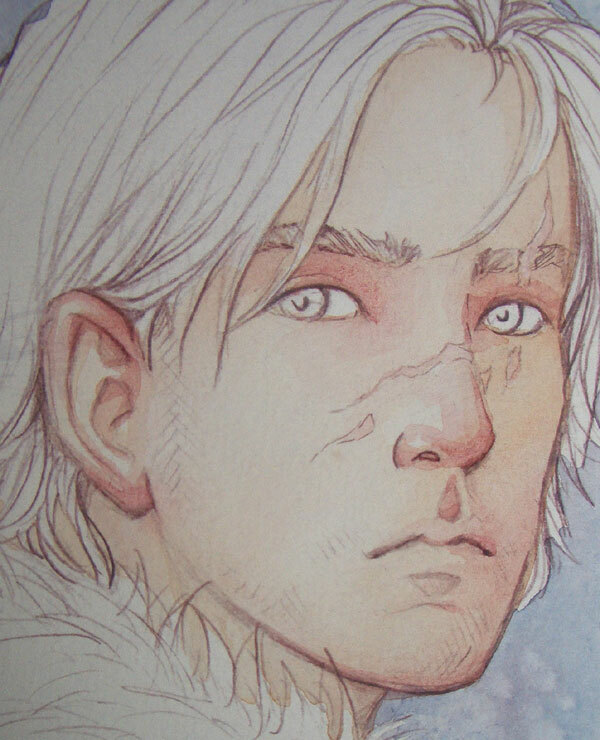 I opted for much the same colours as in “Jon Snow”, and ended up again with Indigo, Madder Red, some Sepia, some Ultramarine, and again Burnt Sienna and Alizarin Crimson for the skin. 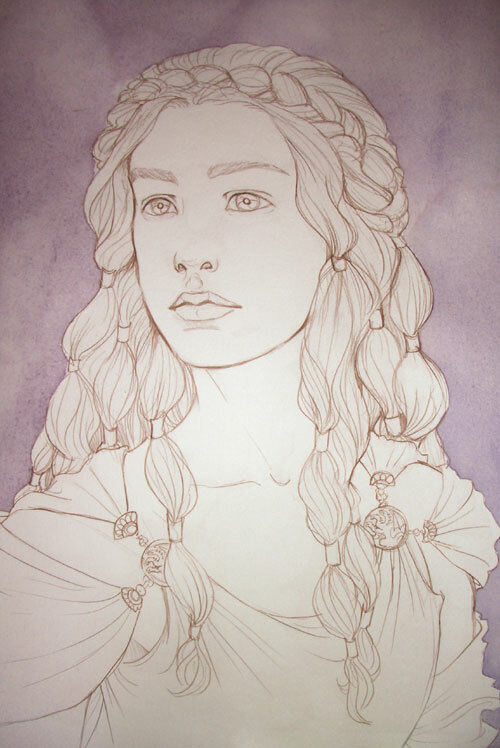 I made Dany resemble Emilia Clarke, who plays her in the series, quite a bit, a lot more than I usually rely on actors. 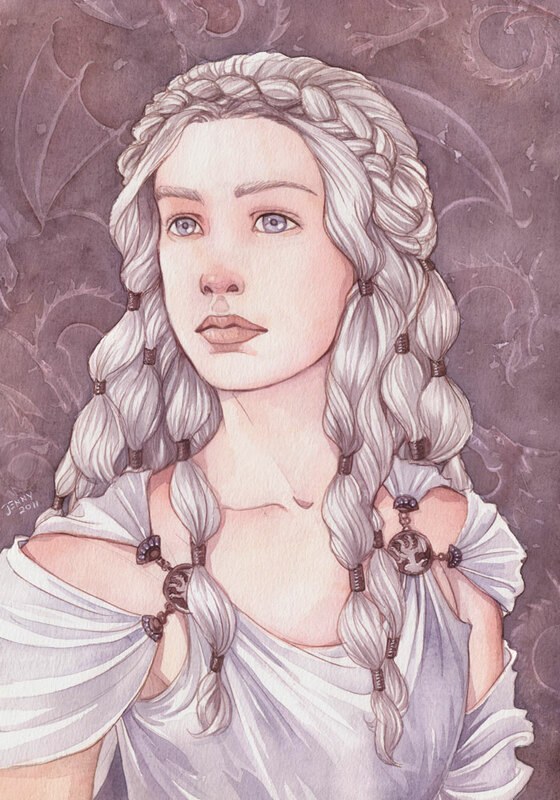 With Daenerys, she never had a face for me, and Emilia gave her one. A very pretty one, I might add. 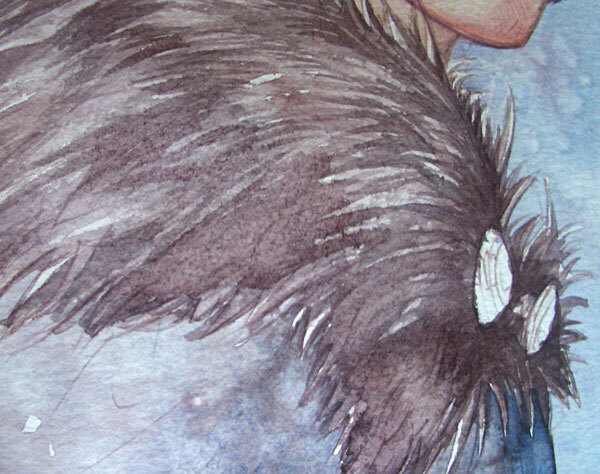 I started, as usual, with the background, painted with Indigo, Madder, and a touch of Sepia. This, of course, means that my water was about as purple as it gets. That came in handy for the hair later on – I painted most of that with my dirty water. When the background paint had dried, I used a hard pencil to lightly draw in some swirling dragon shapes all over the background space. 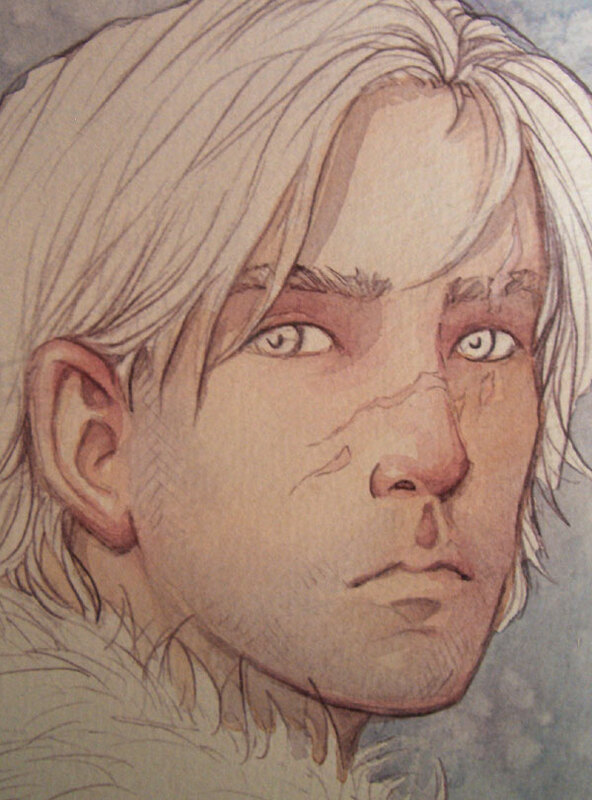 They’re not erased afterwards; the next watercolour layer renders the pencil lines pretty much invisible. 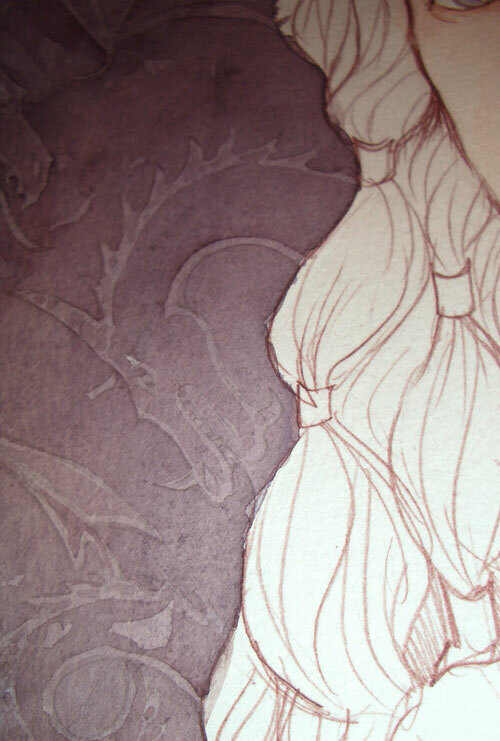 Erasing on just-dried watercolour paint is not a good idea, by the way – the paint will bleach. It’s still a better idea than erasing on not-yet-dried watercolour paint, though – the paper will come off. With a size 6 brush for the wider spaces, and switching to a size 3 synthetic brush for the finer details, I painted the second background glaze, carefully painting around the dragon-lines. 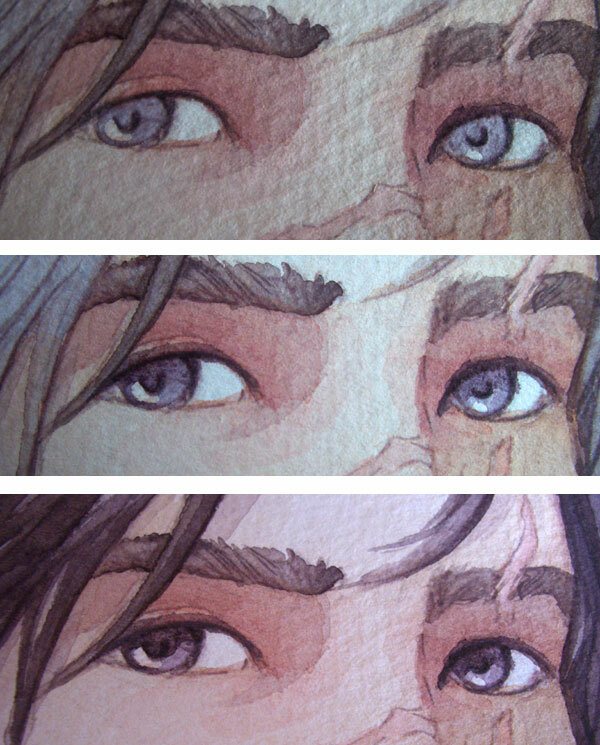 I used a slightly darker and slightly redder shade than the base, for some variation in hue. The light lines you see on the right there are my first, dried wash. The darker areas have just been painted. A background pattern *can* work just like that. In the case of this picture, however, I felt they stood out too much, adding too much distraction to the very delicate figure in the foreground. 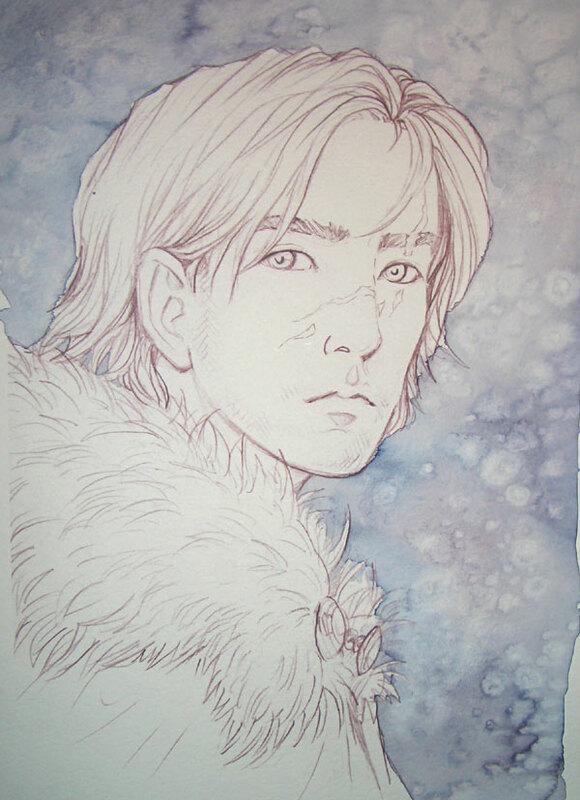 So I decided to add another wash later – when this one ha dried. I painted the second skin layer in the meantime. 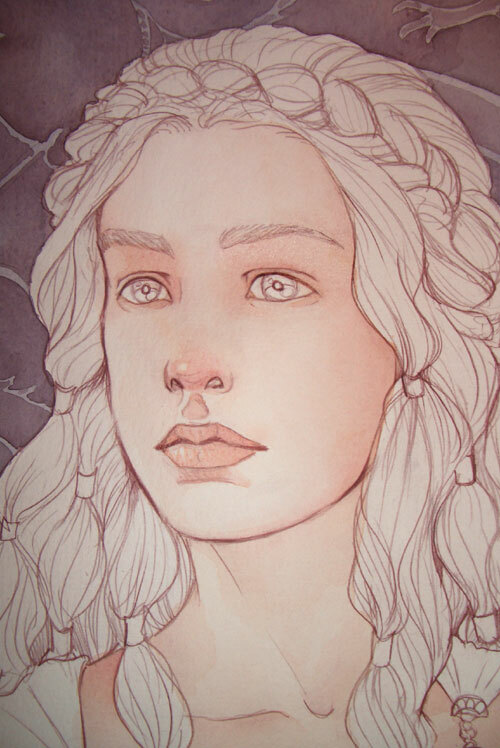 I wanted Dany’s skin to look almost translucent in this one, so I didn’t add many shadows. Mainly, I used Sienna with lots of Alizarin Crimson for the blush I suppose a very hair-haired girl will acquire when she spends most of her time riding under a southern sun. 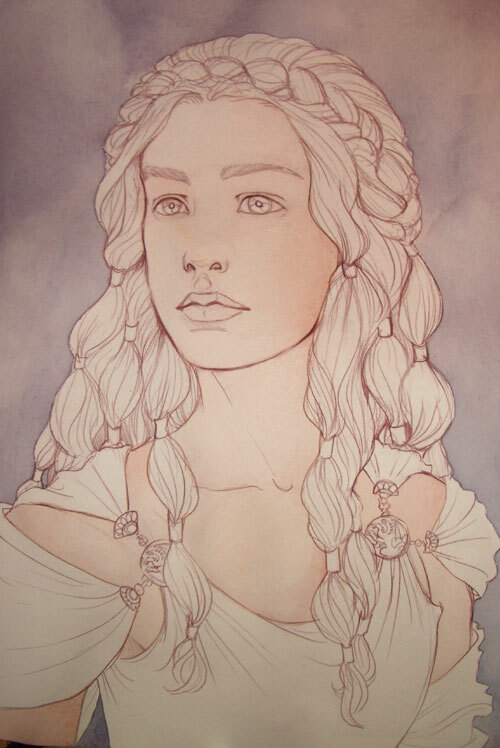 Some shading was done to her cheek, but not much. When I was done with this, it was time for the last background wash. Using a rather large brush (size 12, only switching to a 6 when I came close to the figure) I quickly painted over the entire background, leaving some spots light here and there. I used the same tone I had mixed for the second glaze, only thinned down with more water, or it would have become too muddy. 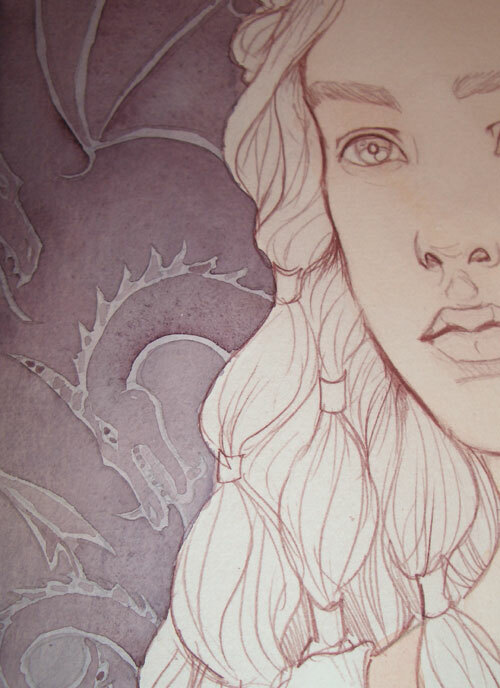 Even so, the new layer did obscure the dragons a bit too much in places; in those cases, I went in with a clean, moist (not wet!) brush and took some of the paint off the lines. I checked it from a distance every now and then (never spend you afternoon with your nose to the paper and get our first good glance at your pic after four hours – you’ll completely lose touch with your picture. 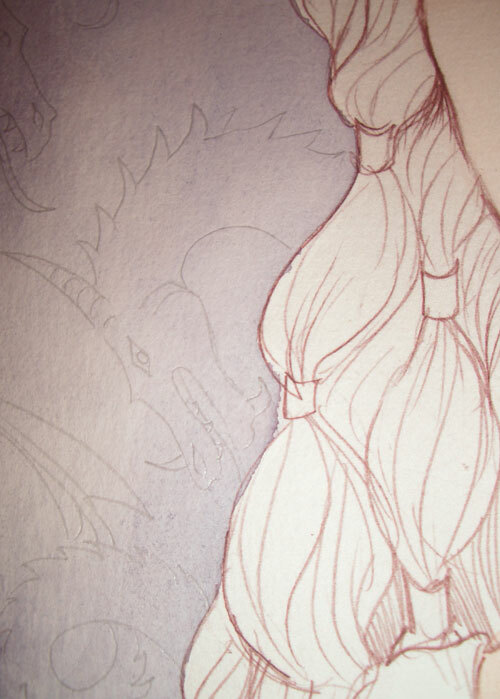 Arm’s length every half hour is usually a good idea) until I was satisfied with the result – definitely dragons, but subtle. 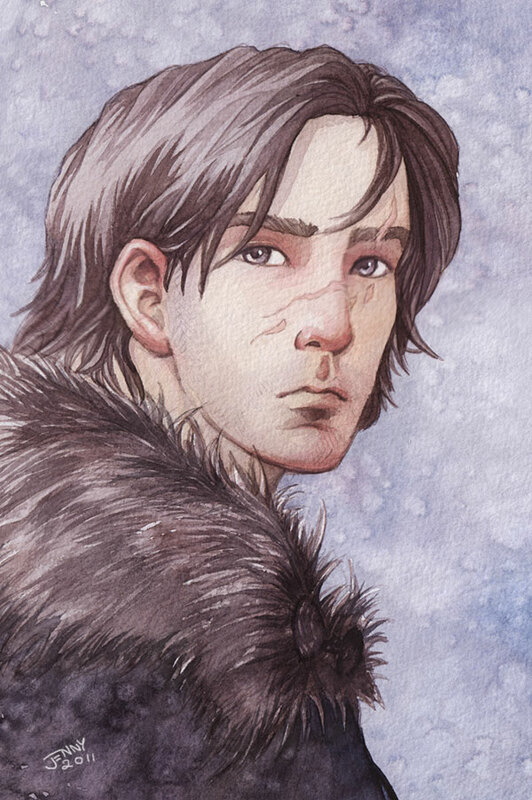 I didn’t take photos of doing the hair – it’s all the same as in “Jon Snow”. This pic started out as a sketch in my Moleskine watercolour book while I watched over two subsequent classes sitting an exam. 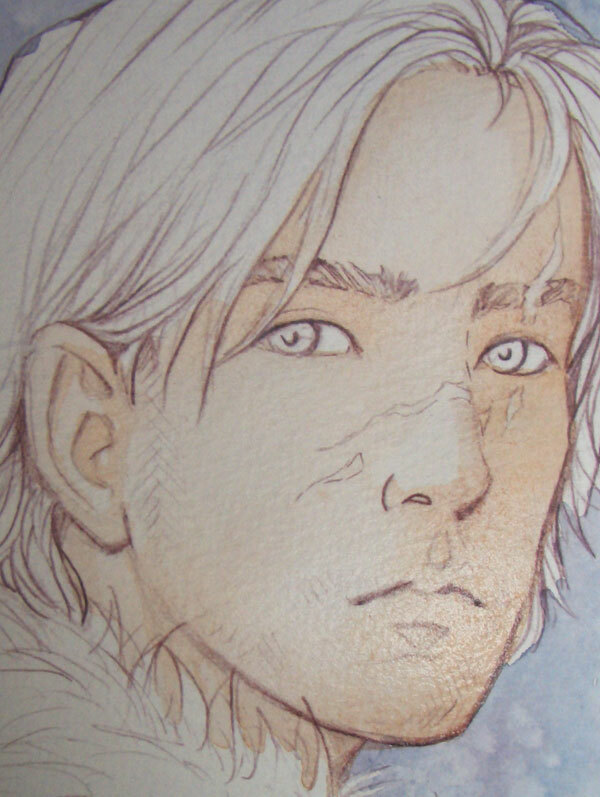 2011 seems to be the year of rediscovered fandoms – first excessive Silmarillion, and now the first “A Song of Ice and Fire” artwork since 2003. I really love the HBO series, it’s extremely well done – the term “epic” really fits here. 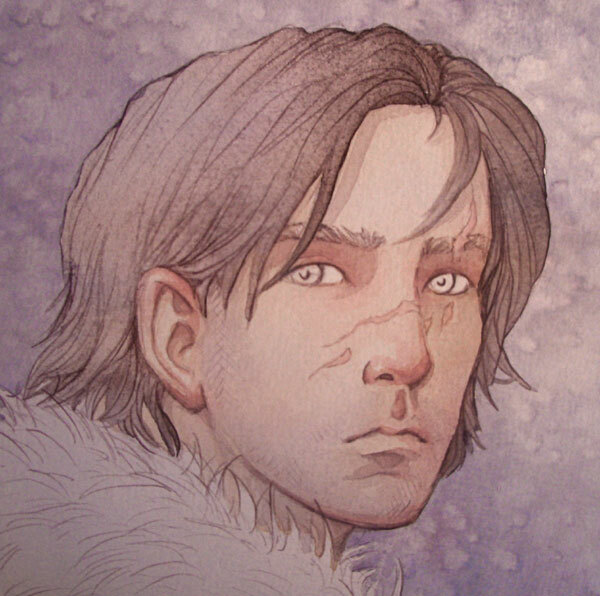 But Kit Harington is totally not my Jon Snow, so I needed to remind myself of what mine looked like. 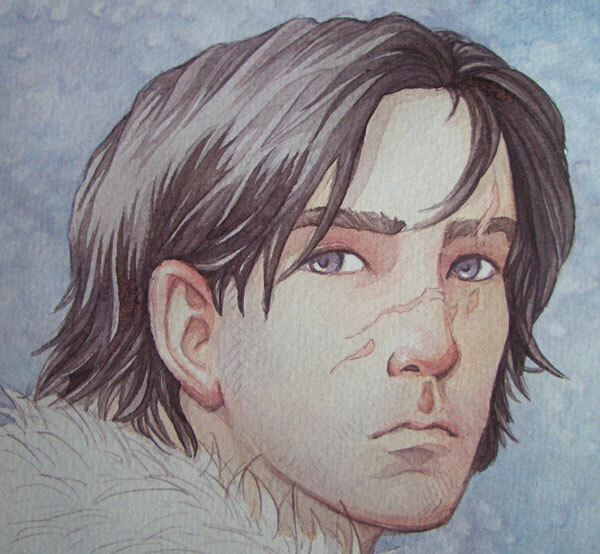 Funny that he turned out to look like — Peter Petrelli. It had never occurred to me, but Jon always looked like Milo Ventimiglia in my head even before I’d ever seen Milo Ventimiglia. So I allowed Jon to stay that way. 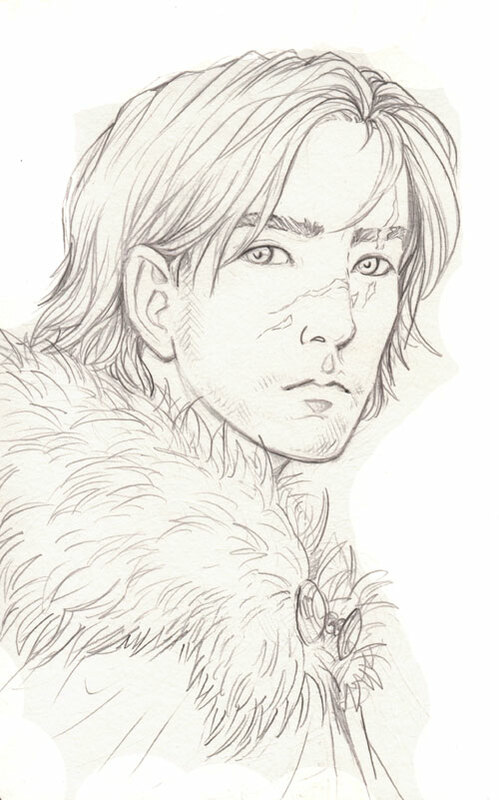 If you’ve only seen the series: he gets that scar later on in the books. Book three, I think.